Having received Authorised VRT Tuition, I am delighted to have become an affiliste member of the Vertical Reflex Therapy (VRT) Network, enabling me to encorporate these new techniques and benefits into my Reflexology treatments. Reflexology is an ancient non-intrusive complementary health therapy dating back 5,000 years, based on the theory that different points on the feet, lower leg and hands correspond with different areas of the body. VRT is an acclaimed award-winning newer form of reflexology that has been taught internationally to thousands of practitioners. Vertical Reflexology Technique (VRT) is a unique method of reflexology developed by Lynne Booth over 20 years, leading to an award from the Institute of Complementary and Natural Medicine (ICNM) for its ‘Outstanding Contribution to Complementary Medicine’ in 2011. The Booth Method of VRT (also known as Vertical Reflex Therapy) is a form of reflexology where the hands or feet are worked in a weight-bearing position for short periods, providing an intensive level of treatment that can aid general well-being, relieve tension in the body and bring about a state of relaxation throughout the body. A VRT trained reflexologist will work on your weight-bearing feet and hands for a few minutes per treatment to accelerate the healing processes brought about in conjunction with classical reflexology treatments. You then recline in a comfortable chair and relax for your classical reflexology session which also incorporates new techniques from the VRT repertoire. How quickly will I feel benefits? Typically, clients usually report improvements within 3 - 6 treatments, whilst some clients may notice an improved sense of well-being almost immediately. Once health is regained, periodic visits are recommended as a preventative measure to balance and harmonise the body. In a small medically approved VRT study on pain and mobility over 60% of participants showed a remarkable improvement in seven weeks. In a VRT workplace study, all clients showed an 80–90% improvement within four weeks. 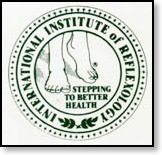 Reflexology, IIR, AOR, VRT, FFR Cert, International Institute of Reflexology, Association of Reflexologists, VRT treatments in Sheffield, Vertical Reflexology treatments in Derbyshire, Finger Free Reflexology, holistic therapies, complementary therapies, alternative health, relaxation, wellbeing, health, peace, calm, wellness, stress reduction, pain management, mobility, spiritual development, personal development, in Sheffield, Bradway, Dore, Totley, Nether Edge, Ecclesall, Norton, Meersbrook, Crookes, Walkley, South Yorkshire, Dronfield, Holmesfield, Coal Aston, Eckington, Derbyshire, Chesterfield, Brimington, Hasland, Newbold, East Midlands, Peak District, Hope Valley, Hathersage. Written to comply with ASA guidelines - hence the frequent use of the word 'may'!